Today I’m sharing fall decor in an area of my home that gets lots of use but is not often photographed… my breakfast nook. It sits in the middle of the “back of the house” dividing the kitchen from the family room. Our home had an open floor plan before open floor plans were in style! StoneGable is divided into two large open living areas… the front of our home and the back. The back area of my home is where most of our living takes place and where friends and family gather. So come on in and let’s have a visit! 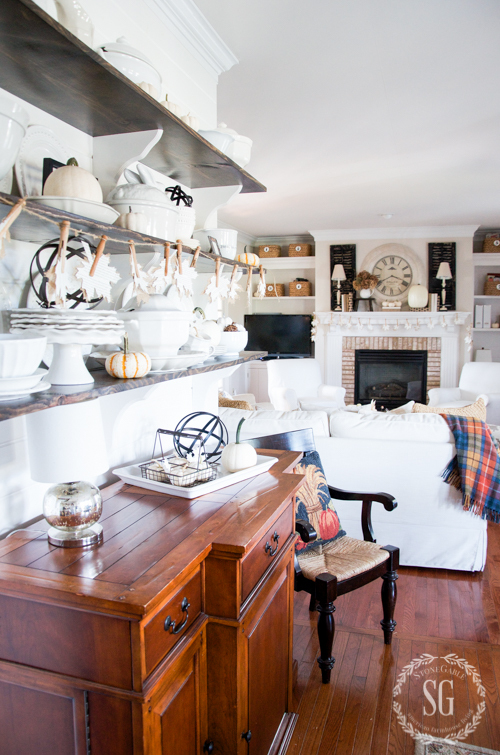 30 bHome bloggers sharing their beautiful and inspiring fall homes! And a chance to win a $250.00 Amazon Gift Card! Make sure to check out this post for details! Here you can see how the breakfast nook is situated in our home. Our round table was made for this room by a local artesian using old barn wood. Bobby and I (and when I say “Bobby and I” I mean Bobby) planked the wall and added the open shelves. 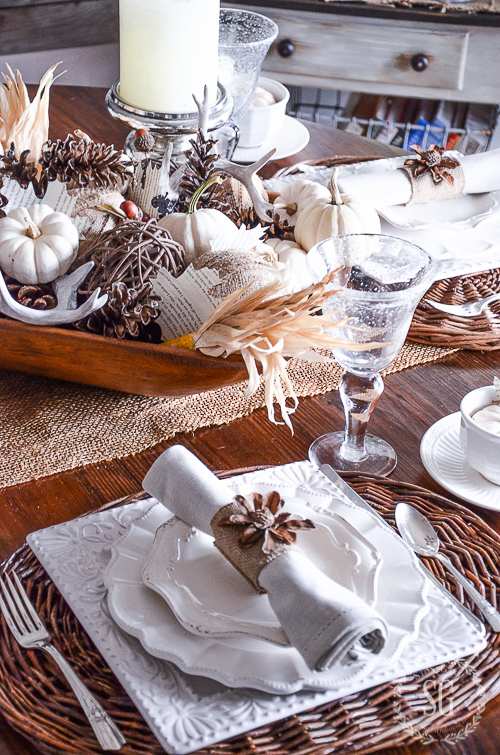 Today the table is set for an easy fall dinner! 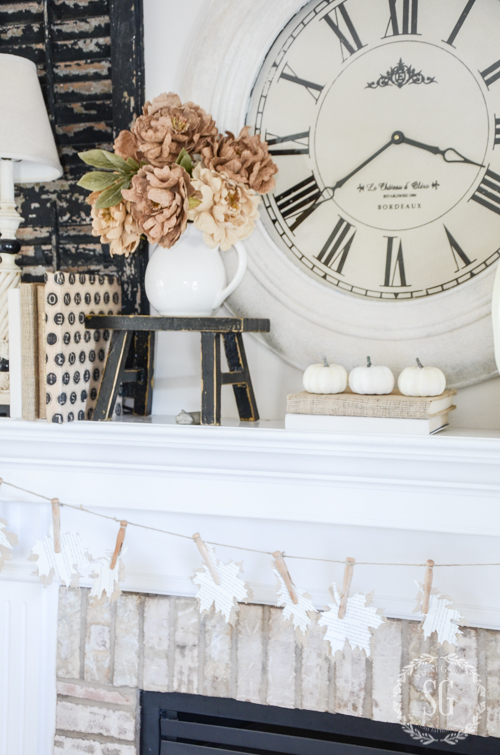 It’s neutral and natural and full of fall elements! 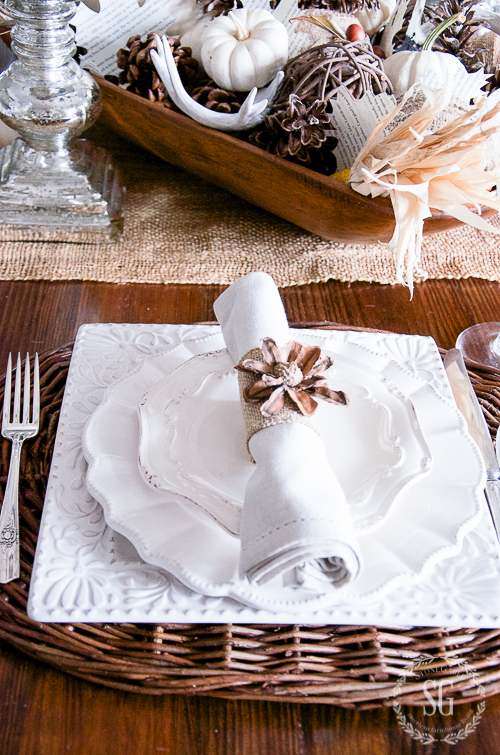 I never get tired of setting a table using white dishes with interesting edges! The rattan oval placemats are a nice contrast! LOVE that rustic/luxe look! 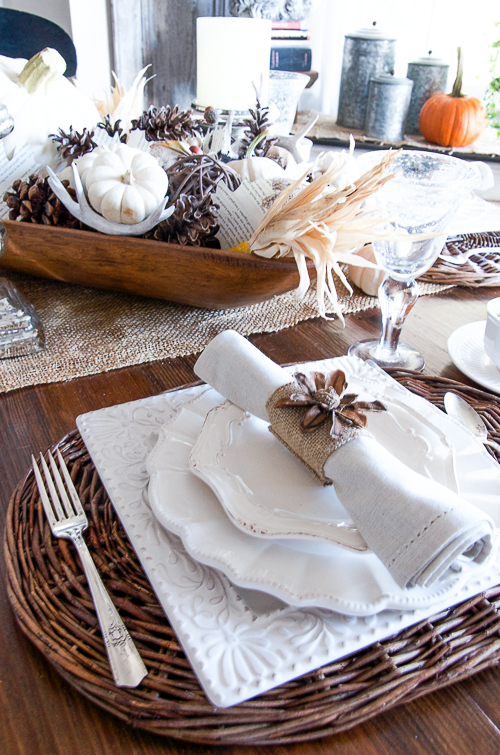 A simple linen napkin is rolled up into a fall napkin ring. 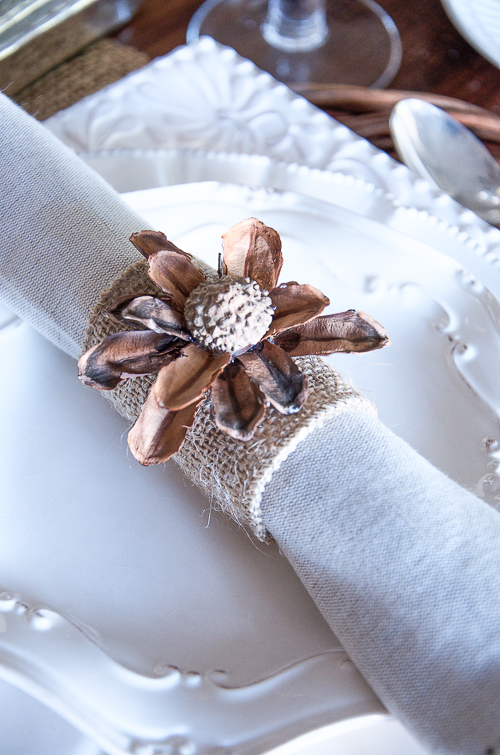 This is such an easy napkin ring to make! I made these organic napkin rings for my Thanksgiving table last year. 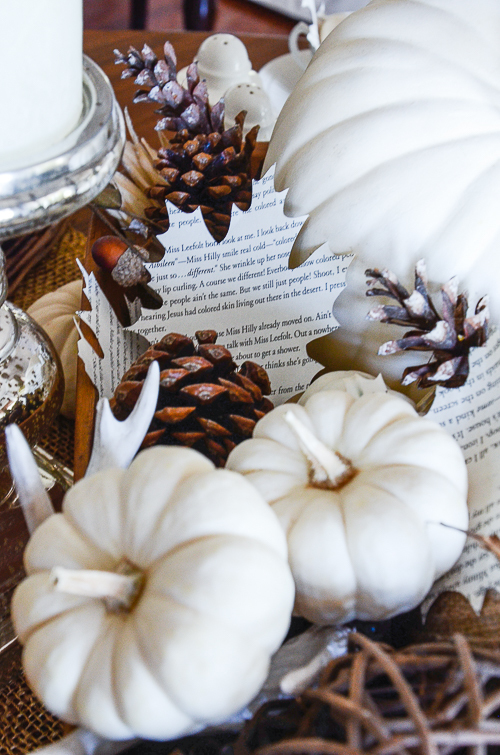 I used simple things to make them… burlap, acorn tops, and pinecones! I have a major crush on mini baby boo pumpkins. They are little and creamy and can fit wonderfully in a coffee cup! And speaking of coffee cups, I like to mix things up a bit with cups and saucers. I never use the same pattern. I think mixing patterns adds a little bit of fun and lots of interest to a table! Book page leaves nestle here and there on the table. 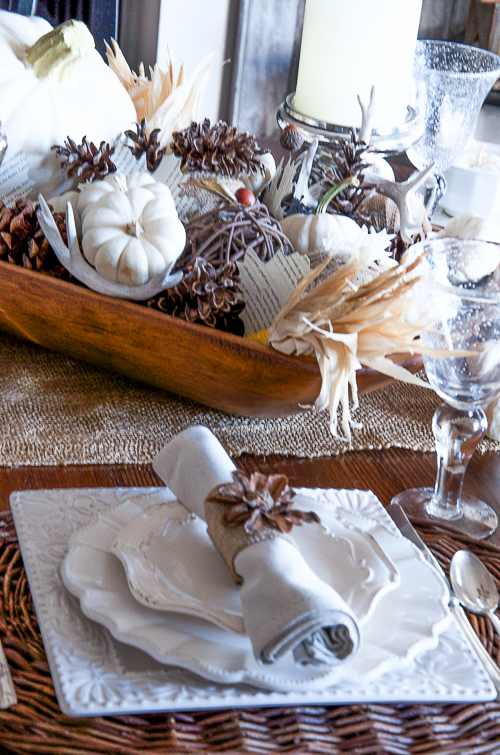 The centerpiece is a dough bowl filled with natural fall elements! 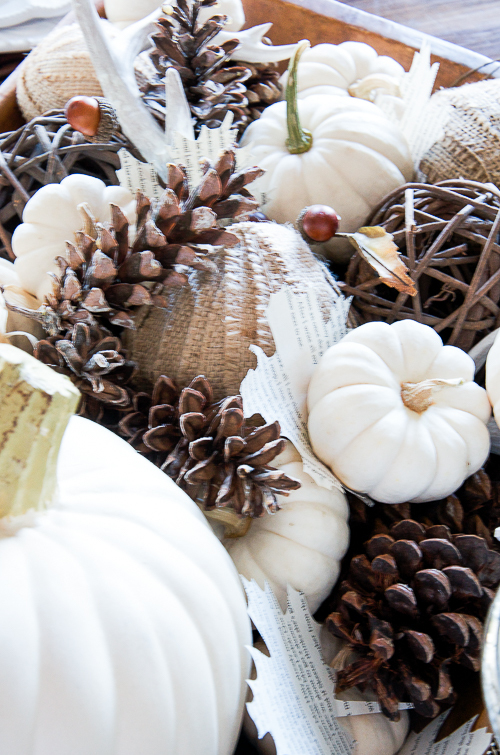 Dough bowls are one of my go-to containers for creating a centerpiece, especially in the fall and at Christmas. Stop back tomorrow and I’ll show you how easy it is to decorate a dough bowl! Again book leaves appear in the centerpiece! This one is a maple! 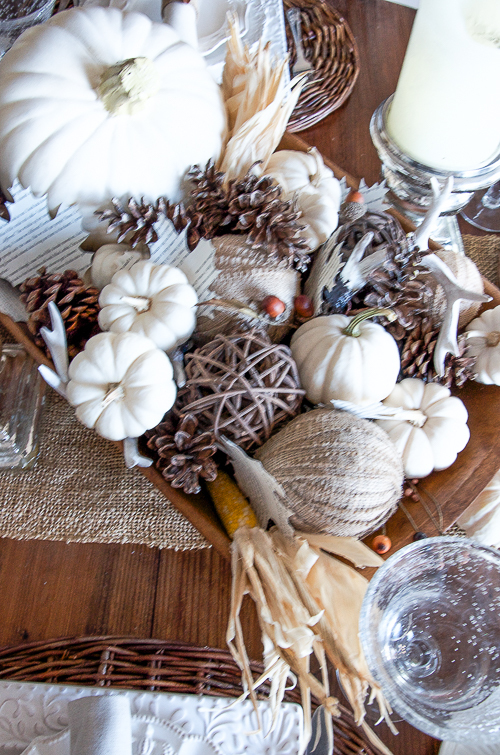 And I continued the theme onto the fall table! You can see a tutorial for the burlap and book page leaf garland HERE, and also get a template to make the book page leaves too. My home is decked in fall’s best bounty! You might like to see a fall tour of the front of my home HERE. And a fall tour of the back of my home HERE. Visit 5 other bHome Bloggers today – 30 in all by the end of the week ! You might like to follow me on Pinterest and see all the great things I’m finding to pin daily HERE. Everything looks so effortless and beautiful! I look and look but never attempt ! I thought I left a comment a week ago maybe I forgot to post it… oops! The table place setting is so pretty I was wondering what you used for the square white charger? That is so me. I would love to find something like that. So beautiful. Thanks for the inspiration. Thanks for sharing. I love your ideas and your generous spirit. You don’t hold any “trade secrets” back from your readers. I pinned the MY PAINT SAINT photo to my decorating board. I think I hit the jackpot when I found your blog. 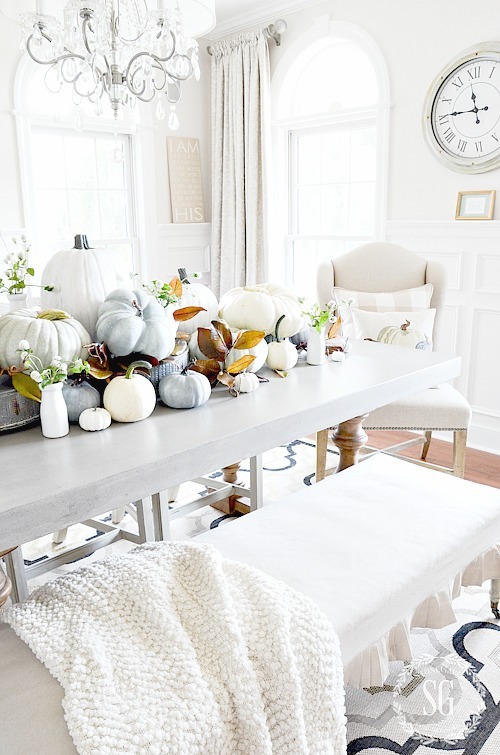 I love looking at all of your fall decorating ideas that I get my inspirations from. I am going to make a fall wreath with the bittersweet like you used and that beautiful burlap bow. So, so pretty. Thank you for sharing your home with us. I like to make and give hostess gifts; your fall napkin rings would be perfect. 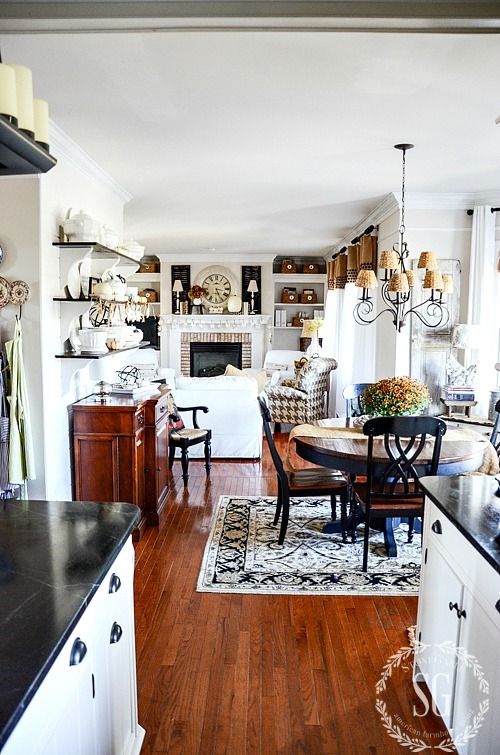 The use of black and white decor in your kitchen/family rooms is beautiful. 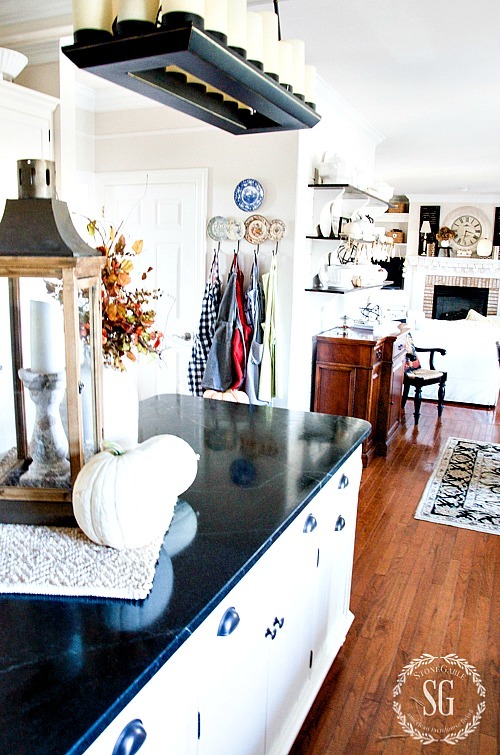 The black kitchen counter tops and white cabinets are elegant. Rooms decorated in black, white, and creams is my all-time favorite color combination. 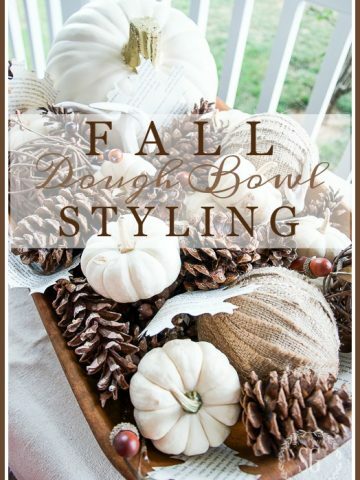 I love your fall neutrals and use of the dough bowl. I have one and needed some inspiration to get it decorated for fall! I’m sure I could use some MPS so I pinned it to my pinterest painting board. I hadn’t seen your breakfast nook, so I really enjoyed that tour! I love the table and the shelves “y’all” did! Can’t wait for the dough bowl hints! So gorgeous! I am feeling so inspired. I love, love, love, white dishes. Where DID you find those white chargers..Love the black counters and white cupboards.. The contrast is stunning. I loved seeing your beautiful fall tablescape and your breakfast nook…..what a warm and welcoming place to enjoy a meal!! 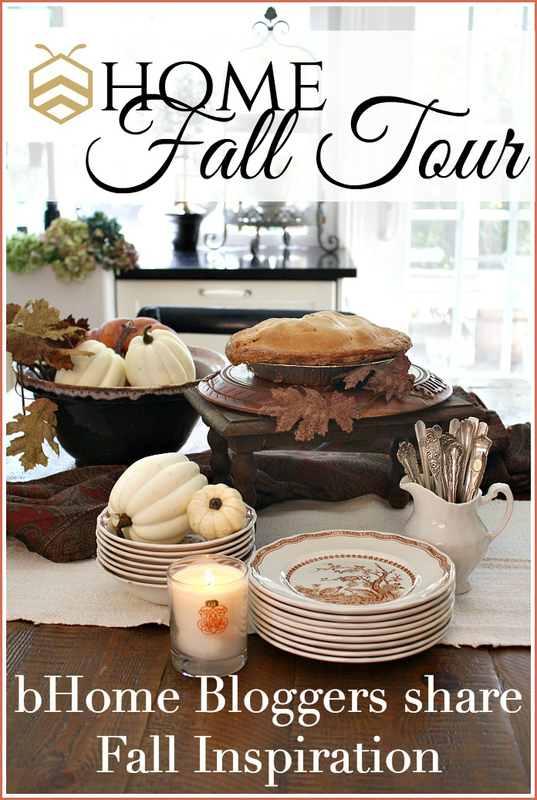 Love your fall decor….. Blessings! Out of all the many gorgeous details in your breakfast nook, one thing caught my eye – your apron hooks! Did you make that yourself? I love the combination of plates and hooks! Hi Marta, I did not make them. However I plan make something like them and post about it. Your home is simple beautiful. Love the open shelving. Hi Megan! Welcome to the StoneGable family! Heading over to shady lane now. Yvonne, it is so warm and welcoming! I love all the little touches and the paper leaves are lovely!! 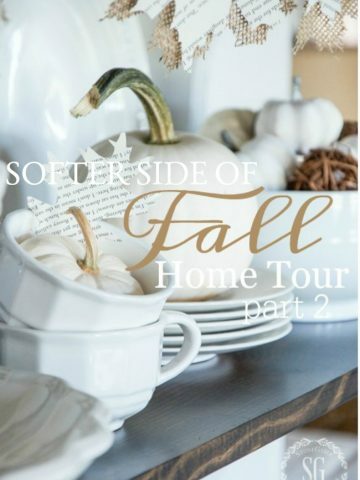 Your home is perfectly decorated for fall- I love it all! 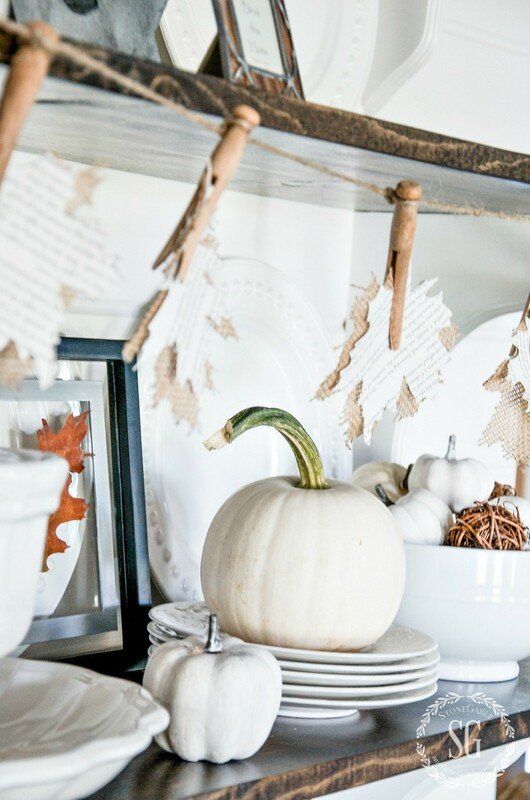 The paper leaf garland, the dough bowl filled with pumpkins and gourds, the layered white plates and woven chargers- so simple, yet so elegant! 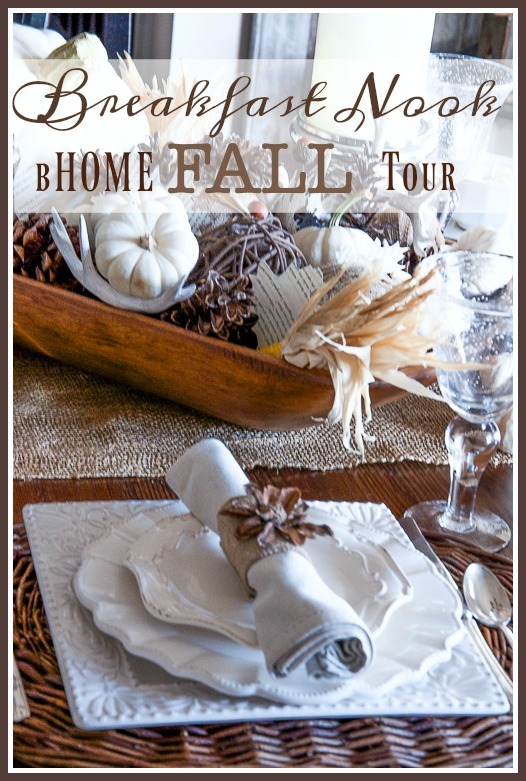 It’s such an honor to be joining talented bloggers like you for the BHome Fall Home Tour! Pretty! Pretty! Pretty! Love everything! Just one questions, on the table – can you tell me where you got the stem glasses or the brand or where I can find them? I bought four at an estate sale and would like to buy more. Hi Sandra, I got these bubble glasses years and years ago on sale at Reading China And Glass. I’m sorry I can’t tell you more. I did :)! Thanks for the chance to win! Beautiful, as always! Mind telling us….ok, ME, where you got the rattan chargers/ placemats? Love them! Pinned the My Paint Saint! I love your table, especially the dough bowl arrangement! I have an antique dough bowl that belonged to my husband’s grandmother and I’m always looking for new ways to decorate with it. I love the antlers mixed in the arrangement- where did you get them? Thank you! So calming and beautiful! Enjoyed the look around! You have changed some things in your dining room also! Probably my favorite dining room ever! Thanks for sharing your love of decorating and your love for the Lord! Love it all! What is the paint color in the kitchen breakfast area? Thank you! It’s official, I am in love with your kitchen/breakfast nook! 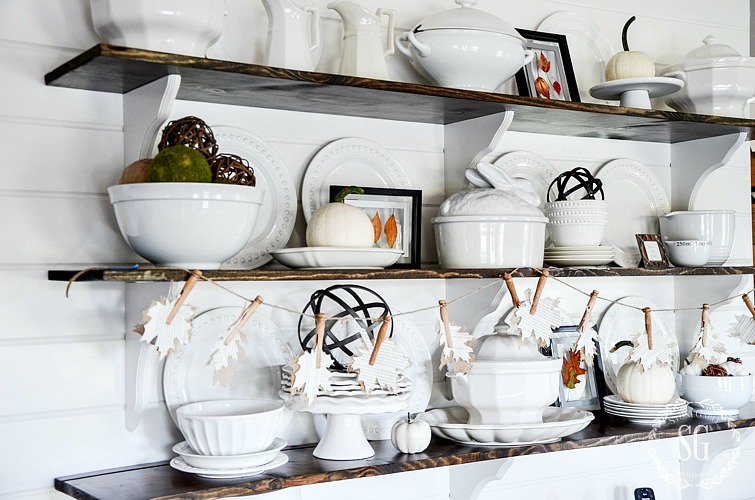 Love your white theme for Fall decorating! I’m getting so many great ideas from your blog. Thanks, Yvonne! Love the dough bowl and centerpiece! Very pretty! And here is the link to my pin!! Love your home. I pinned the Paint Saint to my Home section. Thanks. Oh, Yvonne! Your home is always so inspiring. I can’t imagine how family and friends must feel as they enter those welcoming doors. Blessings to you! Thanks, Christy! Blessing to you too! I personally love all the “eye candy “in your home (not gonna lie, I love ANY candy). I could spend all day just admiring your fall decor inside and outside. Everything is tastefully done to perfection. I always adore your amazing home! You come up with such wonderful “eye candy”! Gorgeous table, gorgeous room, gorgeous home! The natural elements are perfect compliments in your decor. I pinned the Paint Saint on my paint help board. What a great solution! I love your fall decode and the white dishes are awesome. I pinned the paint Saint to my crafts board. Love the table top centerpiece. I love, love, love your breakfast nook. I have one too, and even have a pinterest board saved for them. I am really liking the neutrals for fall this year, but am having a hard time switching everything over! Thank goodness for spray paint!! 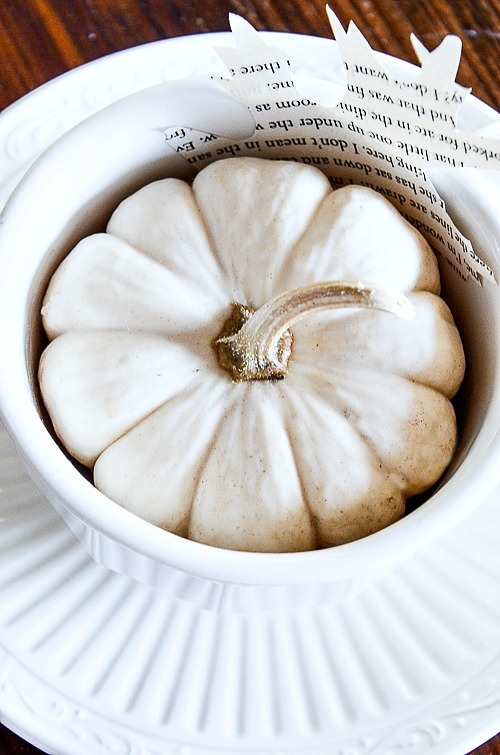 I love the idea of Baby Boo pumpkin in a tea cup. Mind if I borrow that idea? I was also glad to see some antlers tucked into your dough bowl. I was afraid they were “out” in decorating. I love to tuck one around a plant or sitting on a stack of books or tuck into my door wreath. Your home is always beautifully and warmly decorated. I post so everyone can use the inspiration! 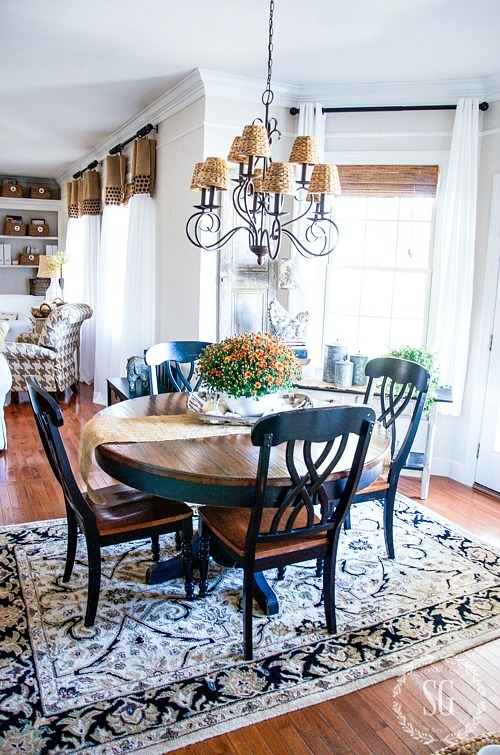 I love the tablescape in your breakfast room! And thanks for the reminder on the napkin holders…I’ve been wanting to make these but it slipped my mind. Just pinned my paint image. Love all the ideas you have for us. Your color scheme is so soft and cozy. Funny, when I ask my husband can we do this or this, he says you mean can I do it and you watch. I say well ok, and probably yes. So when he is doing something for me I always say can I help and he says just stand there and look cute. I try!! I always enjoy seeing how you decorate for each season. You inspire me! I ned r pinned your post. Thanks for the opportunity to win. Fingers crossed. Yvonne, your home is beautiful as usual. I’m in love with the round table. Digging out the dough bowl to start decorating for fall. I’m so happy to be receiving your blog posts again. So happy you are too! I pinned! I loved this post. So many different angles of your home I’d not seen, or saw with fresh perspective, and found so much inspiration. Still eager for Sunday’s post! I love the white plates with all the textures and designs. Especially with the pops of color. Very Welcoming. Wow, just wow. All of it. No I mean it- ALL OF IT! I love your style. I love how you are able to mix simple items from nature and combine them with white using lots of texture and it is absolutely gorgeous! Thank you for all you do so we can enjoy your eye candy! Your breakfast nook, like the rest of your home, is beautiful! 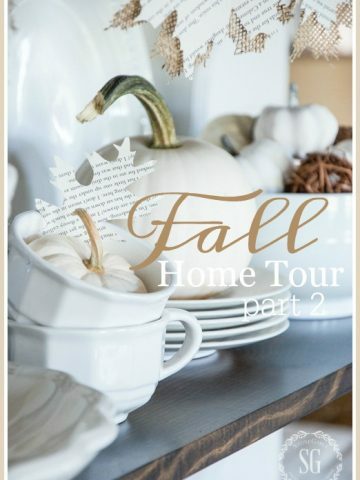 Your home is very warm and inviting and I love how you decorate for fall. I pinned the My Paint Saint to my painting board on Pinterest. Yvonne, your ideas give me a jump start every day. Can you post where you get your energy? I want some so badly! Oh, I don’t have that much energy! I just love what I do so so much! And I LOVE my readers… like YOU! Love the fall post! So many great ideas. I pinned the My Paint Saint to my house and home board… Hope I win ! Yvonne, your home is so lovely and speaks Fall so well. I love your opened shelves in your breakfast nook. Enjoy your fall week. Love the tour! I have all white dishes, but I need texture. Shopping is now on my list for some new textural dishes. I am looking forward to tomorrow for the, how to style a dough bowl. Thank you! Thanks for the beautiful pictures . They remind me of what a house COULD look like. I think that the little white pumpkins are so sweet! I’m going to look for some when we go to the pumpkin patch with our grandchildren this weekend. Have a wonderful time! Those little pumpkins are the perfect size for little hands! It’s amazing how beautiful you can make white look. Everything is always so well put together Yvonne. Speaks to your talent!!!! I love the mixture of texture and patterns on your table!!! 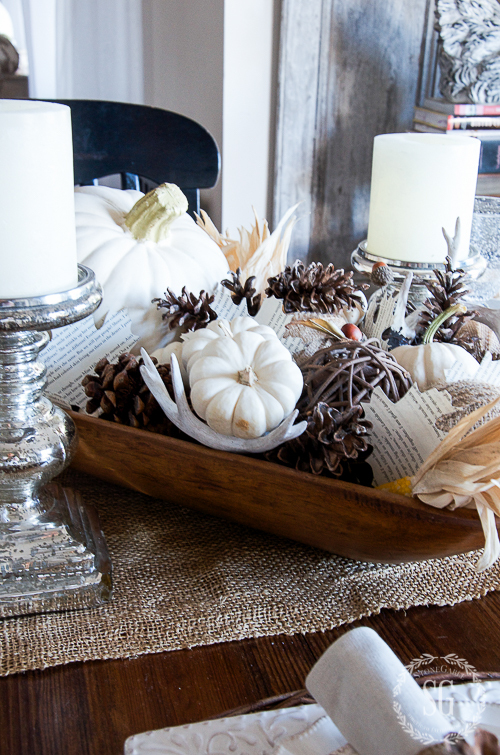 Love Fall Decorating of any kind. Yours is always one of my favorites!! I pinned the My Paint Saint but from Pinterest as it would not let me from here. Very interesting concept I must say. Hi Pat! You will love MSP’s. I have three and touch up is so so easy! Your home looks beautiful! I like the velvet pumpkins. 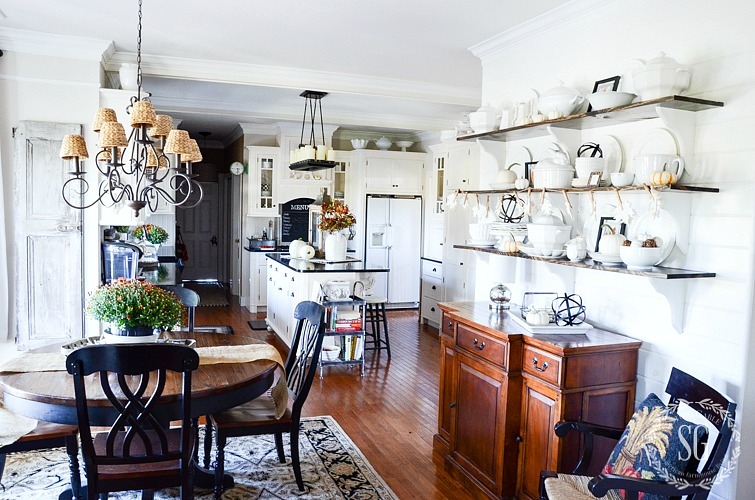 EVERY single time I see that gorgeous breakfast room …. I smile !!! Fall tour is amazing !!!!!!!! Thanks for the beautiful fall tour! Loved it and have pinned My Paint Stain. Yvonne, you have such a lovely, welcoming home! It is everything a home should be, personal, beautiful, a place where family and friends will be happy to be.Your breakfast nook is wonderful, and I love the shelves that you and Bobby built, too. I love doing this tour with you, wish I could sit in your kitchen and see you in person. Hope you have a beautiful fall week! I wish that too, Lidy! You knocked it out of the park again, Yvonne! I adore your breakfast nook and your entire home. It’s always so pretty and inviting. I love your planked wall and bookshelves and I think Bobby needs to come to my house! lol Have a wonderful day and, as always, I love touring with you! Love every part of your home, so inviting and the feeling so warm and beautifully decorated, thanks always for sharing. I wish I had you to organize and decorate my home! I love your style!! And ideas! Sweet. Bobby must enjoy your beautiful decor as much as we do. My hub would be pushing everything out of his way every day and making me crazy. Ha, I know what you mean, Tracey!! My late husband used to do the same thing when I decorated certain spots that he felt should be basically kept empty. Bobby calls my blog “our family business”! So cute! Once again your table is lovely. I also have a white plate fetish (okay, not just plates…serving bowls, platters, etc,) I love how you used the natural placemat here. It anchors everything so nicely. Love the little boo pumpkins. I have a hard time finding them in white in my area so usually I’ll get orange. We finally have white and soft green/blue pumpkins up here but if you can’t find any, just buy some dollar stores ones!! Instead of chalk paint, I used inexpensive craft acrylic paint and then followed with a touch (here and there) of FolkArt Antiquing Medium and they turned out pretty nice. The first coat is VERY streaky and doesn’t cover much but the third coat definitely does the trick. Let them sit for a day before (gently) rubbing on the antiquing medium. If you can’t find it (usually at Walmart or Michael’s) simply use brown acrylic craft paint. If I knew how to add a photo, I would. Total cost for a bunch of white and a few soft green/blue pumpkins was $1.25! I already had the craft paint and medium. 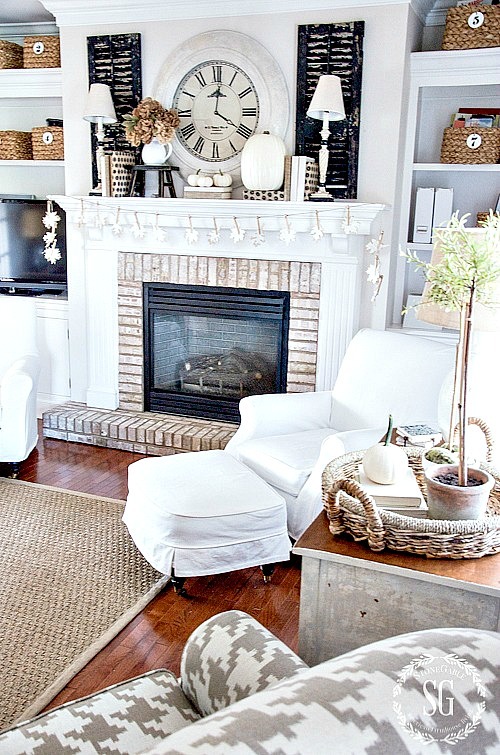 Love how you use neutrals to decorate with! Everything is gorgeous as always! Happy Fall! I wasn’t able to pin the My Paint Saint image from this article. I Googled the image, clicked on the link to go to the article, found the image there, and pinned it to my interior decorating ideas board. I love those book leaves and have been meaning to make some…I’m going to add them to my to-do list and hopefully make some today. Thanks for going the extra mile Jen! Great thinking! I think you kitchen/breakfast nook, is my favorite part of your home…..and every time i get a glimpse of your counter tops i’m in love with them all over again. I am curious though, as to what the door is to the left of your aprons. Is that a powder room? I found that the area shown was far to cluttered for my taste, a little goes a long way, Fall for me is about color, no eye candy here. I do enjoy seeing what others are doing, and do find many idea,s on your blog, however this time not so much. My intention is not hurt your feelings and hopefully you do want feed back. Hello Velda: I really enjoy Yvonne’s blog and many others as well. Sometimes a person’s inside decor just doesn’t suit the oranges and rusts of Fall but are able to incorporate those colors outside. Giving an opinion in an email is difficult as without facial expressions and tone of voice, one can sound quite critical and curt. I’m sure you didn’t mean to sound that way and Yvonne didn’t interpret your Cmment as such. I was surprised to see three orbs used on the shelving instead of one but Yvonne obviously likes it and after all, it is her home! I felt one orb would have had more “punch” but if three makes her happy, then that’s all that matters. She spends many, many hours creating and maintaining this blog and does a wonderful job and the ease (for us) of sourcing articles and her lovely clear photographs makes reading her blog a delight. Several years ago I replaced my bridal china pattern with two different sets of white dishes, along with various other pieces which I mix & match for more visual interest. Much more versatile and easier to maintain. Don’t you love mixing and matching Patricia! White with wedding china sounds gorgeous! I love that name Genie… the gathering table. May I steal it? Your farmhouse is cozy and ready for the season. I love those cute napkin rings. Fun touring with you! What a wonderful post to pin. 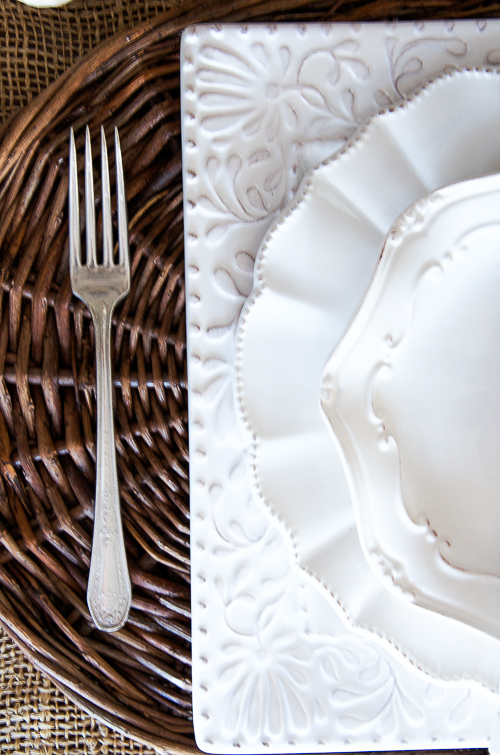 You have the most beautiful white dishes and so many of them. I could sit down in your breakfast nook and have coffee anytime! 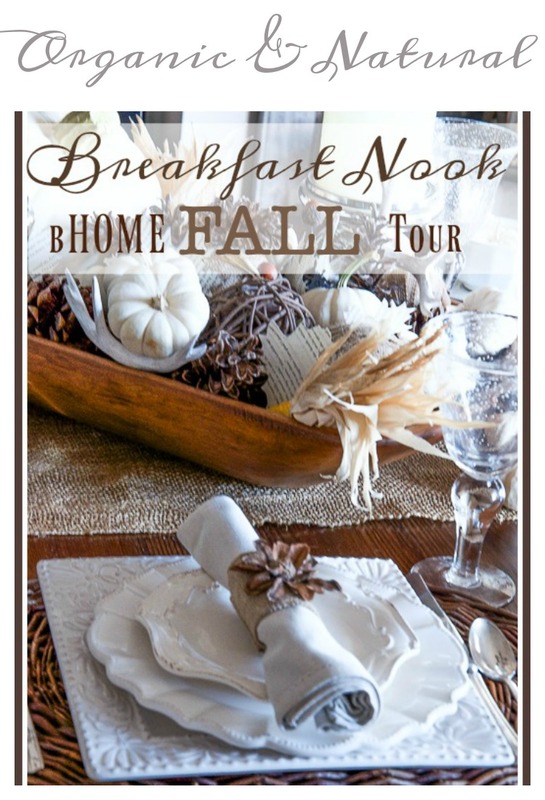 Love your breakfast nook – love your home!! That’s simply beautiful, I love your tablescapes and vignettes the most! 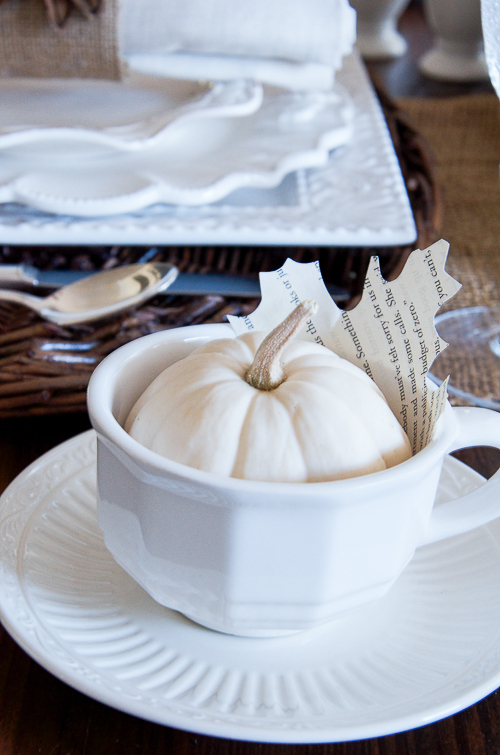 I love the natural elements, and the creamy white baby boo pumpkins, and the book page leaves, that’s such a cute idea! I need to make some of those, I have a die cut machine so I could use my leaves dies and make some for sure. It just looks so natural and beautiful, and of course, the white plates are just the best! You can never, ever, have too many white dishes (in my opinion). Love it! I agree with you about white dishes Karen! Love your breakfast nook! I’ve incorporated more neutral fall decor this year, too. Yours is an inspiration! Pinned the Paint Saint info, thanks! Thanks so so much! I love pinners! And I love love love My Paint Saint. I use them all the time! I an not a computer savvy gal, but I do have a Pintrest account and now with the Paint pin- 3 pins! Our visit to your Breakfast Nook was such a sweet one. Thank you for all you do for us. I luv the crispness of the all white table setting !! I pulled out the white dishes (I’ll need to buy a few more bowls and a charger or two !). Your home is beautiful. it is so fun seeing your home from all the different view. I liked the items shown at the end of the breakfast nook fall? tour. I also watched the tutorial on My Paint Saint and I ordered one !!! I desperately need to do some touch-up work and was dreading the mess !! I have three My Paint Saints and love them! Touch up is so so easy!!!! 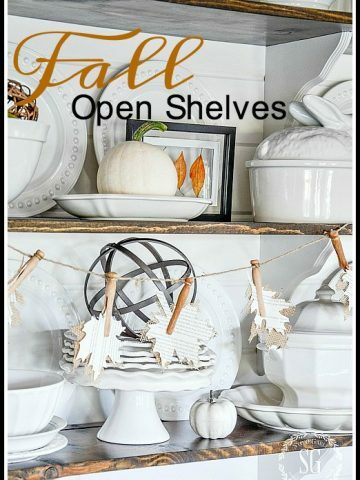 Love the Fall decor and helpful tips! I pinned the My Paint Saint link to two of my Pinterest boards @jljordan56. What a great idea. Laura, I just LOVE you!!!!! I love the natural touches with white dishes also! Beautiful contrast! Oh there is that beautiful breakfast nook area that I had the great pleasure of sitting and having brunch there. A wonderful space with a gorgeous view of the cornfields of the amazing farms that surround StoneGable. I love seeing your pretties on the shelves that “you and Bobby” built. I always have to scroll up and down a few times to get in every detail of each beautiful image. Love all of your “so Yvonne” creative touches. Love touring with you today! Miss you! … Maybe by the time I see you again, you will be a Grandma!!! I can’t wait to see you the next time you are up my way!! !